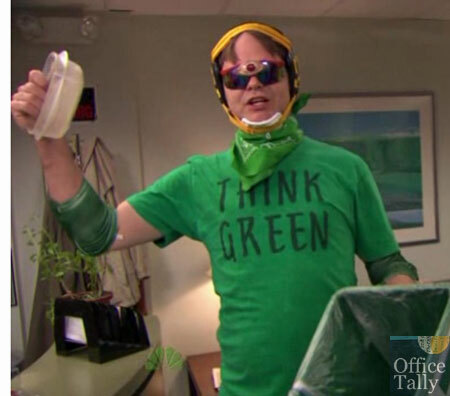 All you need to know about Recyclops, Dwight Schrute’s green alter ego on The Office. Create your own Recyclops poster! 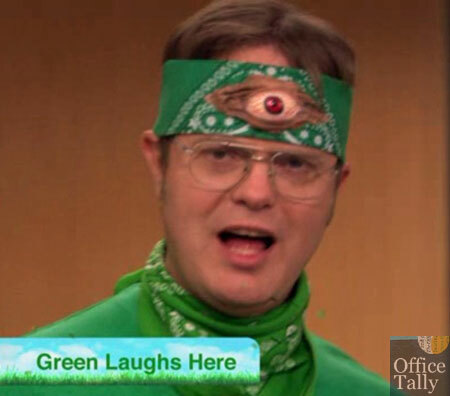 From NBC.com: Dwight is bringing environmental awareness to Dunder Mifflin Scranton through his Recyclops character. 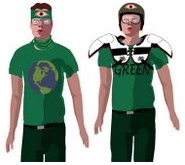 Using our design tool, create a Recyclops-themed poster promoting green awareness. Next year’s Halloween costume, anyone? 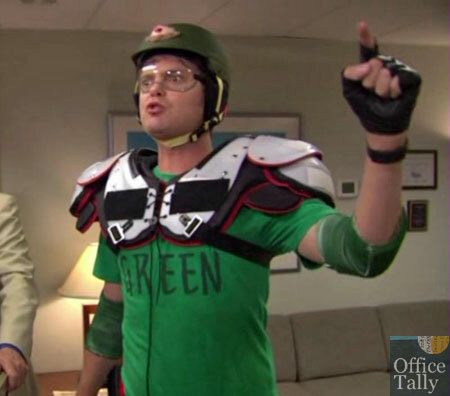 Recyclops: Bow down before Recyclops! Jim: Five years ago, Corporate said we had to start a recycling program for Earth Day. 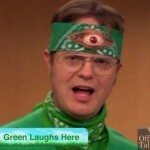 So Dwight took the lead on that and introduced us to a very close friend of his named Recyclops. 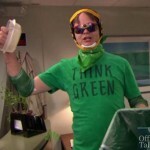 Recyclops: Happy Earth Day, everyone. I’m Recyclops. Did you know that an old milk carton can be sawed in half and used as a planter? Jim: The next year, he really stepped things up. Recyclops: Who has put a #7 plastic in a #4 bin? Jim: A year after that, Recyclops really began to take shape. 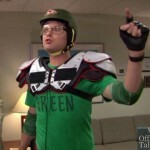 Recyclops: Recyclops will drown you in your over-watered lawns! Jim: Then tragedy struck Recyclops, when his fictional planet was attacked by some other fictitious thing, I can’t remember. 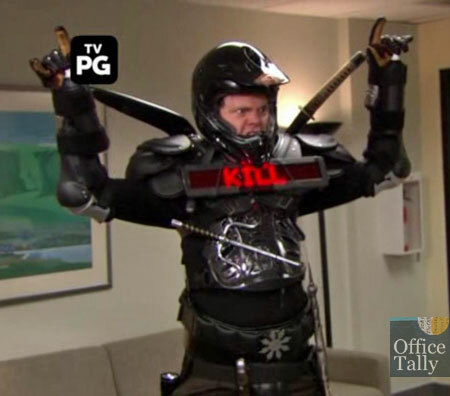 Recyclops: Recyclops will have his revenge! Jim: I think this was also the year that he renounced Earth Day, and vowed to destroy the planet he once loved. Pam: Omigod, you guys, look! It’s Recyclops! Stanley: Oh is today Recyclops Day? Stanley: I thought you were killed by Polluticorn or something. Andy: That’s aerosol spray. It’s terrible for the environment! 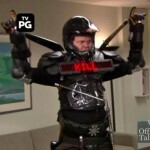 Recyclops: Humans are terrible for the environment! Pam: The thing I like most about Recyclops is that he’s creating a different world for our child. A world where you truly can be anything you want. Jim: God bless you, Recyclops, and your cold robot heart. Gotta be the cold open right? AWE. SOME. Is it Thursday yet? And can I have my name legally changed to “Poluticorn”? Pretty fantastic cold open (assuming that’s what it is). 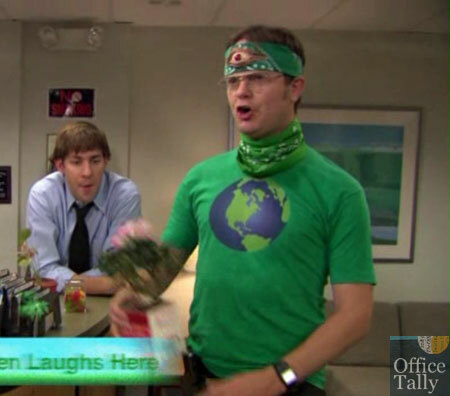 I guess Dwight thinks Earth Day is in November. I also guess that he decided to dress up as recyclops two times during July-November ’08 (Ryan and Ronnie at reception). I do still think that there was some CGI going on with old Jim and Pam. That was fantastic. They even brought back Ronnie the receptionist. I love how Dwight gets so into his character that he completely loses sight of what he was originally planning to do. They even brought back Rice-a-Ronnie! This looks great. Does anyone else think it’d be interesting to have like some lost episode, where it’s something that took place like 4 years ago. The end. According to an NBC/TheOffice facebook post, this is the cold open for Thursday. Pretty great!! I liked it a lot! @#4, I thought the same thing about the CGI. However, one thing threw me off that maybe someone here could clarify for me. Jim was going through the flashbacks of Recyclops, and we saw Ryan sitting at reception. Then, we hear Jim say, “a year after that, Recyclops really began to take shape,” with Ronnie sitting at reception. I thought Ronnie was receptionist first, and then only a few weeks later, Ryan was receptionist. Am I missing something, or is this what I figured — yet ANOTHER continuity error? That was awesome. The timeline confused me though. Jim was talking about the scenes like they were successive years (“the next year” “a year after that”), but they jumped from Pam to Ryan to Ronnie. The only times we’ve seen Ryan as receptionest was in S2 and S5, and Ronnie was in S5. So they either skipped over seasons 3 and 4, or ThirstySchruteBaby is correct. Either way, kind of weird given Jim’s wording. Hilarious and awesome, but weird. I can’t wait!!! Love it! What episode was it that Jim kept looking at Ryan at reception, and he went “What?!?”? Ryan was probably from that time then. Even though the timing seemed a little messed up, it’s funny that they brought Ronnie back for one tiny little cameo shot. It was a nice touch. I’m totally with you! Them mentioning the baby in the talking head made me rewind it a couple of times (Maybe 3 or 4 times…Okay…It was like 7) I got really excited! I hope that’s not the only scene of them in this thurs’s episode! Ryan was at reception when Pam went on vacation one season. Why has Dwight not been fired yet? I wish we had more than a second with the old Jim and Pam! And you guys, SERIOUSLY, CGI? Wouldn’t it cost a heck of a lot less to just do their hair and make-up as old Jim and Pam? Do they really look THAT much older? 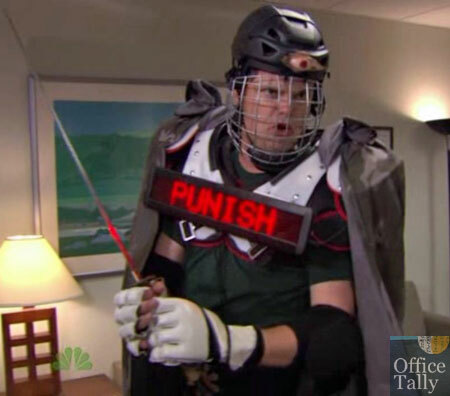 While yes it is a little over the top it is not at all above Dwight’s character because he would become lost in a character like that and make up a storyline to it making him a villain. 23: You can tell that all of these scenes were filmed recently just by looking at Dwight’s hair. I’m not really sure why people think a bunch of CGI was involved either. We just need someone from The Office to explain how they did the flashbacks. It was either CGI, old shots that were saved or they re-shot them. Regardless, I’m confused by it all. 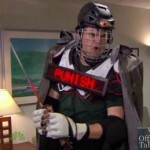 And I love Recyclops. They definitely just dressed up as their old selves for those flashbacks. How hard is it to put on a different outfit and do your hair differently? This would make only 4 years total, though, so it was not “five years ago”. Also who knows how this really works as Earth Day is in April and it is November. Earth Day is April 22, and it’s November now, so Jim didn’t necessarily mean they were exactly a year apart. I think people worry way too much about stuff like this. Ryan, Ronnie, and “old school Pam” have all been at reception at one point in the past, and it’s a funny gag. Enjoy it. @30, I wish I could agree with you, but it just seems like continuity errors are a semi-often thing nowadays. To put it bluntly, it feels like a slap in the face to those of us who have watched each episode a jillion times, which I’d say constitutes a number of fans of this show. The writers aren’t going to do cool stuff like this anymore if everyone nitpicks about it not being perfect. CGI please…. There are continuity errors on every show. I like seeing some continuity, but no, I don’t really care about most of the minute, trivial little details that people on the internet seem to always complain about. I want them to focus on making a funny show. I’m glad most people still enjoyed the Recyclops bit, in spite of the continuity error. I like when The Office does something the majority of the masses like (even if I don’t like it), because it bodes well for future seasons of the show. For me, personally, the error was just too distracting even when the episode aired, even though I was prepared for it. hey kool aid man, wasn’t ryan a replacement receptionist for a few weeks? Remember, when Pam and Roy went to the Pokonos for their vacation? Not sure if this is the right time period, but it’s a possibility. I agree with you, and I’m glad that not everyone catches those, even though I do as well. That would make an awesome Halloween costume! It’e funny how they created a scene from years before when Dwight first did it, and Jim redid his hair… it looks so different!